The new HQ features a variety of flexible spaces. Here, a closed office that can accommodate a small group for a meeting. All images by Beppo Raso, courtesy of Sinetica. The new Italian headquarters for Richemont, the Switzerland-based holding company, clocks in at 80,000 square feet, distributed over four above-ground floors and two below. Completed in August 2012, the space was designed by Logica Architettura and brings together 15 of Richemont’s luxury brands as well as a workshop to repair watches. That efficiency was key: Richemont did not want the new workplace to look like a boutique. They wanted to communicate efficiency as much as, if not more than, luxury. As for the closed offices, they are more traditional, but they’ve been built to ensure privacy and accommodate smaller meetings within the larger, more flexible space. After the gallery, check out our Q+A with Riccardo Salvi, an architect on the project with Logica Architecttura. The problem of reduced privacy typical of open space arrangements has been solved by defining equipped work areas, also in the center of the room, with medium height containers from the Use Me series by Sinetica. The Ten Up system by Sinetica was used throughout the project because its straight and shaped worktops can be used to create different compositions. The service areas, such as the central courtyard and the first floor bar, have an important role in the project and help to define perception of the workplace. 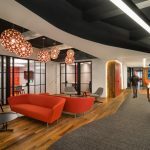 These are designed as living areas where relationships can develop and the quality of the work environment is improved. What makes this office different from Richemont’s previous HQ? Richemont Italia is the Italian branch of Richemont International, which owns several of the world’s leading companies in the field of luxury goods, with particular strengths in jewelery, luxury watche,s and writing instruments. The group encompasses several of the most prestigious names in the luxury industry including Cartier, Van Cleef & Arpels, Piaget, Vacheron Constantin, Jaeger-LeCoultre, IWC, Panerai, and Montblanc. Richemont Italia had the need to bring together in one building all the group’s brands which hitherto were scattered in different locations. We were then asked to design the “Great Richemont Home” where all the functions were brought together to share waiting areas, meeting rooms, common areas, breakout areas, support spaces. The key words were: enhance productivity, reduce costs, encourage interaction, increase flexibility. How does the design of the office reflect the luxury brands it represents (in other words, do the brands shine through in the design)? For Richemont it was important to communicate efficiency and accuracy, rather than luxury. This is a place of business and not a boutique. So the main goal was to create a peaceful, cozy environment where people could work well and feel comfortable. The project has therefore focused on creating an environment that had to be functional but also pleasant. No special effects: “correct” is the right word. And I think that the “correctness” of a project is the focal point of architecture, anyway. What is the culture of Richemont like and how are the employees reacting to and adapting to the new office space? At the beginning any change is seen as a threat to the peace of mind. We have tried to share the most of the choices in order to meet all the requirements and I have to say that the result has been very much appreciated. If a project is “correct”, it can be easily understood. In the new location Richemont has 15 brands, and a workshop to repair watches. Everyone had different needs. Combining these differences has been the most challenging job. How are employees adapting to the flexibility of having both open/closed office spaces? In general employees do not like open spaces because of the noise (even if carefully controlled with devices for the acoustics) and lack of privacy. Usually they prefer closed office spaces. We have worked to try to create small workgroups within the open spaces so that the requirements of flexibility and teamwork were safeguarded with the needs of tranquility. No, I have to say that we have planned everything to the last detail so everything was carried out as planned, no surprises. Careful planning is a fundamental fact in order to achieve the goal that you want. In this case, we had a very tight schedule and a very strict budget. The goal could only have one outcome: no extra time, no extra budget, an efficient workplace that could stimulate creativity.